Consider the larger universal conversation and how invisibility perpetuates violence. The cyclical repetitious act of the inability to empathize, sympathize, or simply listen to “other” continues violence. Chaos feeds chaos. Lutzner explains, “we are repeating the same mistakes again and again; we are a huge machine never learning. Our mouth opens we take it in, repeat; spit and begin again.” Lutzner places us in both positions disassembling “other,” so that “By the end of the poem … the reader is no longer innocent. One can’t turn back.” She places awareness onto the responsibility of the reader questioning, “How often as a nation do we sit by and watch atrocities occur without saying anything? We know we should, we say we should, yet, we sit by and do nothing. It happens everyday.” Lutzner asks us to quite simply wake up. Erika Lutzner is the editor of Scapegoat Review. She curates Upstairs at Erika’s, a monthly writer’s salon in Williamsburg, Brooklyn. She is currently working on an anthology on the topic of truth versus fiction in poetry and how the lines intersect which will be out this coming fall. She divides her time between NY and a tiny island in Maine. I was told I was inarticulate as a child, which led me to feel unable to speak. I felt invisible, and I turned to books as a means of escape. Anything seemed possible on the page. I would imagine myself as the characters in the books I was reading and they took me out of myself for a time. I didn’t make a conscious decision to become a writer but I knew that I wanted a way out and that writing gave one opportunities (or so it seemed in my make believe world). Later, when a tragic event occurred in my life and I didn’t know how to deal with it, I had no way to cope. Writing was the thing that kept me alive. I know that if I didn’t have writing, I wouldn’t be here now. Without writing, I couldn’t exist; it is as necessary as air. As a child I loved Flannery O’Connor and Carson McCullers. I also loved Aesop’s Fables and Grimm’s Fairytale’s. I used to read by flashlight under the covers in my bed. I read Anais Nin, Robert Pirsig, Anne Rice, Stephen King and Henry Miller (my mother’s bookshelf). It didn’t matter that I couldn’t understand what I read, I had to read. I stayed back in the second grade because of a problem learning to read, so when I finally could read, I read voraciously without regard to content. I could tell you what I had read verbatim even though I didn’t understand it. I still love O’Connor. I have always been drawn to the dark; it makes me feel safe. Some of my favorite writers now are Paul Celan, Aimee Bender, Rilke, Heather Lewis, Wislawa Szymborska, and César Vallejo. My go to writers are Roald Dahl and Raymond Carver; those who take me back to the everyday darkness I crave. I look toward language as well as content these days. As a child I was just looking for something to take me to another place. The work is always dark, always beautiful and always carries me away from myself; that hasn’t changed. I think what has changed is that now perhaps it’s a little more complicated although I am not sure about that. I tend toward visceral work now, but I did as a child as well. Maurice Sendak was probably my first true inspiration. “Where The Wild Things Are” scared the daylights out of me but also fueled my desires. Shel Sileverstein too. “One Sister For Sale” and “Where The Sidewalk Ends” were such great poems. And “The Giving Tree” is still a favorite of mine. Sharon Olds was my first love. I didn’t really know about poetry before her. Her poems “True Love” and “Cambridge Elegy” got under my skin and never left. They speak of what love and death are really like. It took me years to find my voice, but in hers, I heard my own, and I would learn not to be afraid to use it. Most of my mentors have been my books. They have taught me more than anyone. Yusef Komunyakaa, Paul Celan, Yehuda Amichai, to name a few. Thelonious Monk, Bill Evans, and of course, my number one inspiration, Jon my husband, most of my poems are about him. Without him, I would not be writing. When I started writing I was very musical and rhymed a lot. That was about it. I wasn’t contained at all. I was vomiting everything out. I had almost 35 years worth of poems in my head at that point. I needed to learn how to write in stanzas and how to control myself. Now I still am musical, but I know how to use the music. I’ve always been a lean writer but I’ve become even more so. I use color and texture to say what I want to say; to build a landscape. I write poems about things other than my family and elegy now. There was a natural progression in my work because I finally got out what had been building up for so long. It had given birth, and I was free. I use prose a lot now that was something that was very freeing for me. I also speak through other voices which has helped my writing break open. I still write on the same subjects but in new ways. I think I’ve been influenced by music without knowing it. I have to force myself not to rhyme. It comes so naturally to me. I played the violin as a child, and my instinct is to put music to words. I used to be a professional chef, and I had a cadence in my head. I dreamt of lamb chops and arpeggios. Many of my favorite writers are quite musical in their writing. I also have been deeply influenced by Shakespeare and elegiac writing as well as drama and satire. I am editing a book about girls/women without voices who are trying to take back their power and I am working on a memoir. It’s a bit slow going as I’ve decided to do it in poetryesque form. I also have a place on an island in Maine, and I would like to start having workshops there, but that is in the way off future! Our voices are getting louder every day. We can and do write on everything. Nothing is forbidden. Sharon Olds was definitely one of the women at the forefront as well as women such as Ruth Stone and Dorianne Laux, they paved the way for us. Dark, elegiac, bitterly honest, humorous and tender, but I hate to box myself in. 9.) 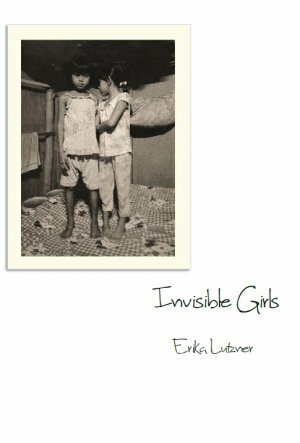 The language in Invisible Girls, published last month by Dancing Girl Press, pays close attention to flowery western ideals of femininity including “glittering,” beds made of “pink cotton candy”. In your poem, “Jorani’s Dream,” these sentiments wrap us in “luminous language,” distracting the reader as we wake up to the witness of “girls imprisoned in the rooms / next to mine”. Can you discuss the tension between our western ideals, invisibility, and the ways in which these cultural norms affect voice? Western ideals and invisibility and the ways in which cultural norms affect voice, that’s a tall order! “Jorani’s Dream” as with the other poems in the collection, is meant to highlight the flaws within our logic. I wanted to show the tragedy of circumstance. I use language because that is my weapon; I learned early on it’s deadly when used correctly—thus the distractions of luminous language as you pointed out which leaves us with the terribly sad ending. This was a tricky book to write because of Western ideals juxtaposing cultural ideals and how it affects voice. I wanted to at all times make sure that I didn’t overstep any boundaries. That’s something I think about all the time while writing. There’s an invisible line I can’t cross. How can I, as a writer, voice my opinion without objectifying these girls? Without doing the exact thing I am accusing the men in the poems of doing. I don’t know that I have an answer. It’s why I write. 10.) The poem, “God Is On Vacation, Refusing To Take Calls,” confronts sensationalized cyclical violence, particularly war and more specifically 9/11, and the ways in which love intimacy and the participation of the body are affected in this discourse. The poem reads, “Look / in the mirror of historical madness; we become / accomplices. The mad are sane, we are all / that remain. Intimacy swallowed by the infinite.” In this landscape the dead become mere “juicy hues” filling the streets. In your opinion, how does the invisibility of cyclical modes of violence affect our cultural lens particularly around the notions of intimacy “swallowed” in the “infinite”? We are repeating the same mistakes again and again; we are a huge machine never learning. Our mouth opens we take it in, repeat; spit and begin again. Without learning the why and how, we will never change. We have war after war without acquiring change. It’s like with the Iraq War, Sadaam and Bush, who had the bigger balls? The answer is communication not murder. I don’t think people may agree with me, but it’s what I believe. Killing is not the answer. An eye for an eye and all the world goes blind. We are being swallowed up into the infinite never to surface filling the streets with juicy hues of murder. This is not the world I want to live in. Not the world my husband would want. Who is sane, who is mad? It’s hard to tell sometimes. 11.) “Cambodia,” presents the chilling feeling of a sepia print acquiescesing the reader to climb inside the frames of the poem and sit street side unnoticed. Here we watch young girls, “Sold for five dollars; given drugs to make them jump like monkeys in a cage.” Muted horror is dulled in the eyes of the girls repeatedly questioning the foreigners, “Mister, want some yum yum?” We find the narrator is listening, voicing both perspectives, and one’s own participation in the invisibility of the girls, ending, “I jump like a monkey”. Can you elaborate on the importance of this spherical conversation and how it evaluates and addresses our notions of “otherness”? You touch on a good point. This is something that is in a lot of my work. In “Cambodia” the reader is asked to climb inside as you say, and does so willingly for whatever reason. Perhaps the curiosity or the horror? By the end of the poem however, the reader is no longer innocent. One can’t turn back. How often as a nation do we sit by and watch atrocities occur without saying anything? We know we should, we say we should, yet, we sit by and do nothing. It happens everyday. We say we will the next time, or our neighbor will, or it’s not our problem. And the cycle never ends. It’s not my daughter, it’s not my war, it’s not my oil, not my shame—“Cambodia” forces the reader to address these ideas because by becoming a willing participant, the reader is culpable now. He/she has become the “Mister” in the poem. The cyclical nature of “Cambodia” is really what the book itself and much of my work is about. I write about invisibility and those without voices in all my work. Those trying to capture their voice; trying not to be silenced any longer. That was one hell of an interview.